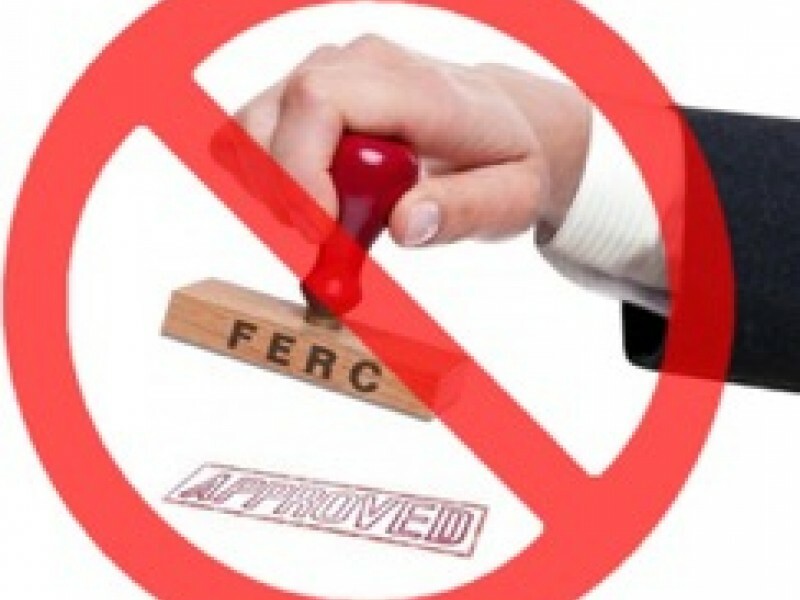 Scurrying to use its rubberstamp before a Commissioner departing leaves it tied 2:2, FERC once again rubberstamped multiple pipelines, this time three on a Friday plus an LNG export project, while neither its main online library nor its backup library yielded copies of the orders. 164 FERC ¶ 61,098, PennEast Pipeline Company, LLC, Docket No. CP15-558-001, ORDER ON REHEARING, August 10, 2018. 164 FERC ¶ 61,100, Atlantic Coast Pipeline, LLC, Dominion Transmission, Inc., Atlantic Coast Pipeline, LLC, Piedmont Natural Gas Company, Inc., Docket Nos. CP15-554-002, CP15-555-001, CP15-556-001, Order on Rehearing, August 10 2018. 164 FERC ¶ 61,102, Dominion Energy Cove Point LNG, LP, Docket No. CP17-15-001, ORDER DENYING REHEARING, August 10, 2018. 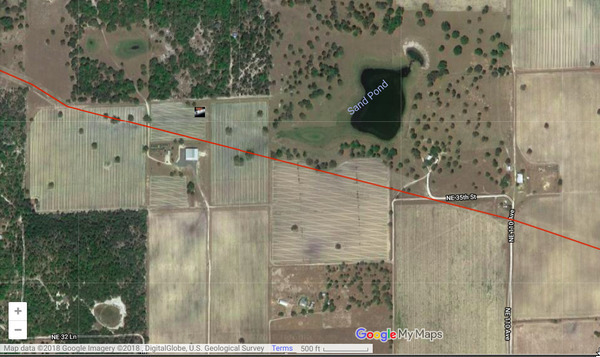 164 FERC ¶ 61,101, Transcontinental Gas Pipe Line Company, LLC, Docket No. CP17-490-000, ORDER ISSUING CERTIFICATE, August 10, 2018. This entry was posted in Fracking, GHG, LNG, Pipeline and tagged ACP, Atlantic Coast Pipeline, Cheryl A. LaFleur, conservation, Cove Point LNG, Dominion Energy, Duke Energy, Federal Energy Regulatory Commission, FERC, Florida Southeast Connection, GHG, greenhous gases, Hillabee Expansion Project, Kevin J. McIntyre, LNG, Mountain Valley Pipeline, MVP, Neil Chatterjee, NextEra Energy, north Florida, PennEast, pipeline, Richard Glick, river, Robert F. Powelson, rubberstamp, Sabal Trail, Sierra Club, south Georgia, Southeast Markets Pipeline Project, Spectra Energy, Suwannee Riverkeeper, Transco, watershed, WWALS, WWALS Watershed Coalition on August 12, 2018 by jsq. I’ve wondered whatever happened to Andrea Grover since she no longer has landowner “stakeholders” to try to sell on her pipeline. 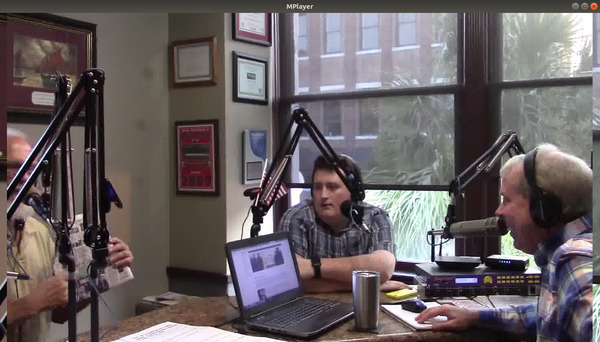 Turns out she’s selling debt bonds for Sabal Trail now, according to a press release of Monday. 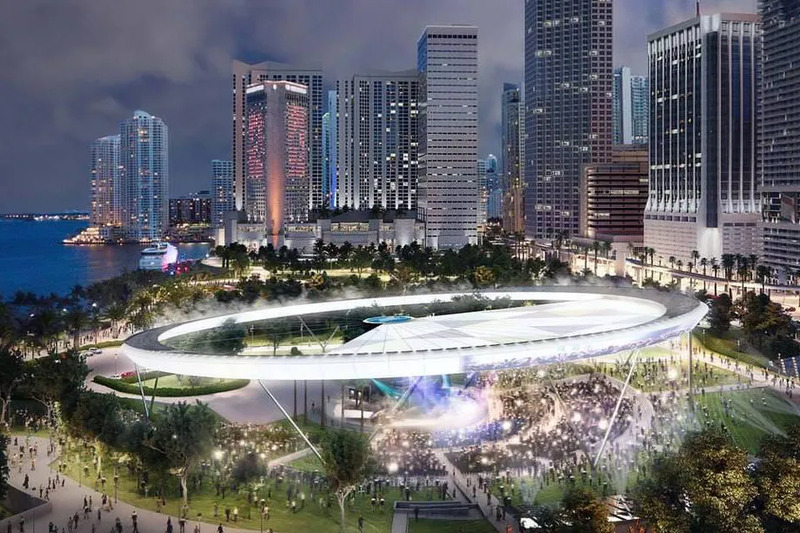 The notes were issued in three tranches as follows (collectively, the “Notes”): $500 million principal amount of 4.246% senior notes due 2028, $600 million principal amount of 4.682% senior notes due 2038, and $400 million principal amount of 4.832% senior notes due 2048. Those sound like good interest rates, especially that 4.832%. But why is it listed on the Berlin Stock Exchange, and what about that Baa1 Moody’s bond rating? 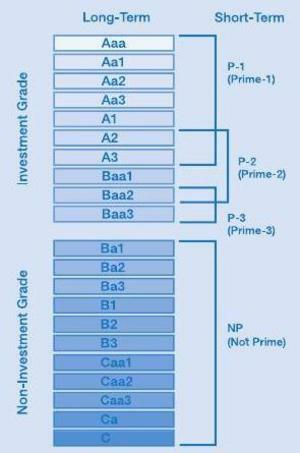 That is eight steps from the top and three steps above “Non-Investment Grade” aka junk bonds. 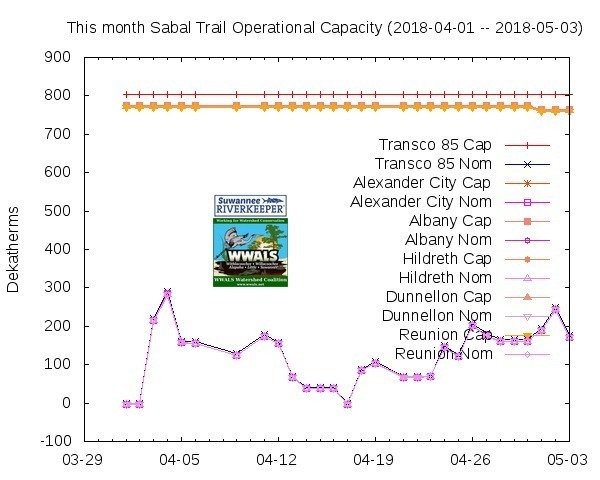 I wonder what happens if Sabal Trail doesn’t make its FERC-extended construction deadlines? 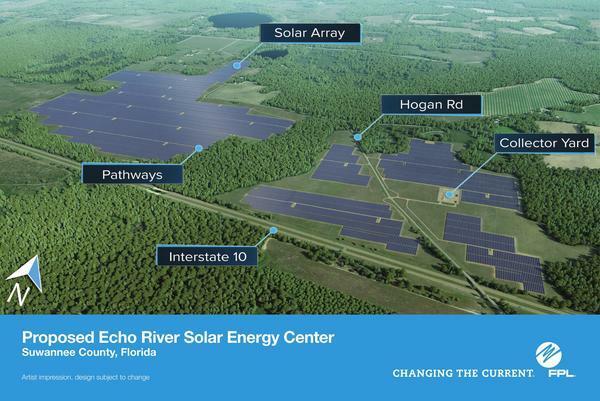 Somebody remind me, what assets does Sabal Trail Transmission, LLC have, as in what recourse would a bond-holder have if the issuer decided to cancel them? 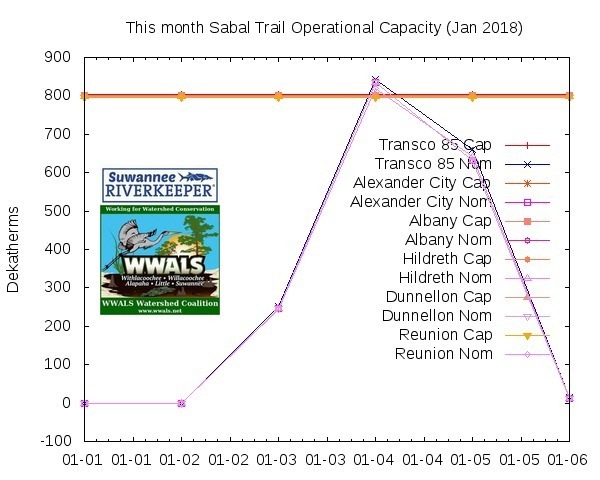 Graph: by WWALS, from Sabal Trail’s FERC-required Informational Postings. 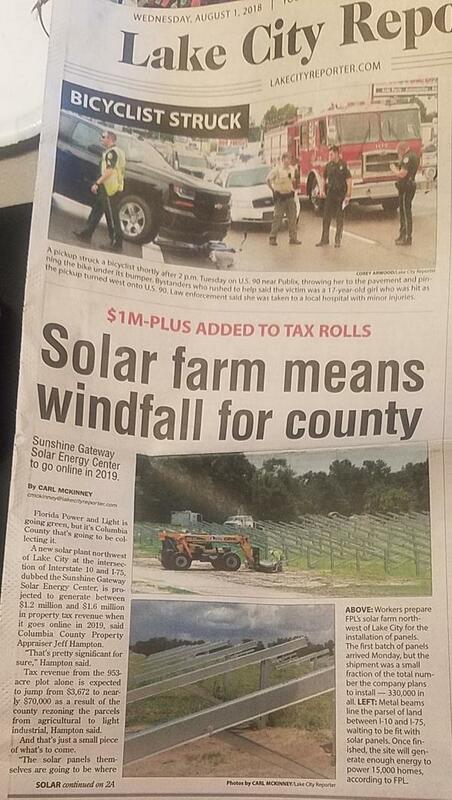 This entry was posted in Economy, Pipeline and tagged conservation, DUK, Duke Energy, Economy, NEE, NextEra Energy, north Florida, pipeline, river, Sabal Trail Transmmission, SEP, south Georgia, Spectra Energy Partners, Suwannee Riverkeeper, watershed, WWALS, WWALS Watershed Coalition on May 3, 2018 by jsq.